Concrete Coatings FAQs - Concrete Coatings, Inc. Concrete Coatings, Inc. is dedicated to assisting our customers in the proper use of our products, allowing for a successful customer experience. The following FAQs have been created to assist with answers to commonly asked questions on our most popular products. We are continuously updating this information. Is there something that would be helpful for us to create an FAQ on? If so, please contact us. Do I need a concrete or construction background? Absolutely not! At Concrete Coatings, Inc., we are firm believers in success through training. All of our materials are very user friendly and easy to install. At our two day training we have you work with the materials and answer your questions along the way. The majority of our contractors have no experience or training in construction, and are very successful. They come from all walks of life: helicopter pilots, machinists, teachers, computer programmers and more. What about support after the training? 'Round the clock experienced technical support access through a toll-free number. (24/7 support is provided from a seasoned professional.) All of our technical support personnel have field experience, not just the right answer from a manual. Periodic trainings on new and existing products and techniques. What about employees? How many people does it take? Most Concrete Coatings, Inc. contractors start out with two or more people: themselves and another person. We maintain the philosophy of "baby steps" and urge you to grow as your business and demand requires it, and is safe and manageable by your standards. In some cases this is a matter of months; for others it may be a year or two, depending on their wishes. Although the process may seem complicated, it rarely is. Two trained people can be far more productive than just simply more bodies. After your initial start-up, we will train as many employees as you need for $99 per person. What is the average size of a job? This is a difficult question, because not all job sizes are reported to us, but the residential national average would range from 400 - 800 square feet. Installations of several thousand square feet are not uncommon, especially on commercial / industrial jobs. How long would it take to install an average job? A job of 400 - 800 square feet with minimal preparation and reasonable pattern etc. would take a team of 2 people of average experience1 ½ - 2 days to complete. This would apply to most any system: Spray-Tek™ Acrylic System, VIVID™ Acid Stain, and Shield™ Epoxy. Many factors play in to this, of course, including distance, preparation, and accessibility, but this may serve as an average for most jobs for consideration. What is the average dry time for the product? Dry times depend on factors such as temperature and humidity. Normally, our skim coat will dry in less than one hour. The spray coat dries more quickly and can usually withstand foot traffic in less than one hour; however, it is still tender so caution is advised until it is sealed. Once applied, this will allow the customer's foot traffic within a couple of hours, however 24 hours is recommended. The Spray- Tek™ Acrylic Overlay products are designed to dry as quickly as possible to help you move from job to job as quickly as possible. Why so many different product lines? Every situation presents a different need. That need may be purely visual, but the need is unique just the same. We have multiple product lines because our contractors can bid on anything from a small front porch repair, to a restaurant that wants an acid stain in front and flake epoxies in the kitchen, to the warehouse that has multiple demands ranging from colder temperatures to strong chemicals. Multiple product lines make you impossible to ignore, and make you far more versatile than just a person that can resurface a pool deck or patio. What about marketing? How does Concrete Coatings, Inc. help me reach my customers? How long does it take to actually start making money? Although this depends a lot on the skills and largely on the motivation of the particular contractor, Concrete Coatings, Inc. prides itself on the way it establishes its contractors. Your entire start-up investment is secured with stocking inventory; in other words, you get tools or materials for your money. This means that as a contractor, you do not have to be concerned with fees such as franchise fees, royalties and advertising fees, etc. Concrete Coatings, Inc. contractors who implement the marketing plan we provide, use our sales process and install even one job per week can have a positive cash flow position within 60-90 days. As a contractor, do I have exclusive rights to Concrete Coatings, Inc. products? As an independent contractor, you have exclusive access to our factory certification program. Due in part to repeated requests from our contractors, Concrete Coatings, Inc. products are marketed to existing concrete distributors nationwide. We know that making products available to you locally will save you hundreds and sometimes thousands of dollars in shipping. What does that mean? Can just anyone purchase Concrete Coatings, Inc. products? It does mean that Concrete Coatings, Inc. products will be available in concrete supply stores. However, most contractors have not had any training or exposure to concrete overlays. With our certification and your personal commitment to constant improvement, you will place yourself at the forefront of the market while offering a service only you as a professional can provide. Although a trailer or panel truck is highly advisable from both a functional and advertising standpoint, how you get started is largely a question of budget and ability. However, a trailer or some means of transporting and storing the equipment should be one of your first expenses after getting started. A small 6' X 12' locking trailer is sufficient for most installations. This is great protection for your tools. Here again we recommend "baby steps” and advise you to grow as you can afford and need to. How does the weather affect my business? Concrete Coatings Inc. offers a full line of both indoor and outdoor applications, with multiple techniques for all of them. In addition, we provide advertising tools to help our contractors who have inclement weather during certain parts of the year begin to install the product inside the customer's home in areas such as lobbies, dinning rooms, commercial areas and garages. Multiple products means more chances of securing work, regardless of weather conditions. Most contractors manage to keep busy year round. Can I get started part time? Absolutely! The Concrete Coatings, Inc. system allows you the flexibility to begin your business at the level you find most comfortable for your life. Many people begin part-time, and eventually work up to full-time. We also have many contractors who have always been, and will always be, part-time. The choice is yours! However, don't be surprised if you originally plan on being part-time, but find that you want or need to go full-time because the demand is so great! What surfaces can Spray-Tek™ be applied to? Concrete Coatings Incorporated Spray-Tek™ Acrylic Systems can be applied to any concrete surface, vertical or horizontal. How soon can Spray-Tek™ be used after application? Can Spray-Tek™ be applied around pools? MOST DEFINITELY! Concrete Coatings Incorporated Spray-Tek™ Acrylic Systems are the ideal solution for pool and spa areas. They are non-skid, cooler than concrete, and will not stain or be adversely affected by pool chemicals. It also provides a perfect transition from pool to yard, adding that finishing touch like no other product can. Because of its versatility, a stencil can be used to indicate depth markings or areas of safety concern. What about heaved sunken or severely damaged concrete? Heaved (raised) concrete, is generally ground down, or the adjacent section is built up using a variety of materials. Severely damaged sections can be torn out and replaced if necessary. This helps to minimize the cost and time of replacing the entire area. What about expansion joints? Are they covered up? Expansion joints and cold or control joints are necessary to prevent cracking of the concrete. Concrete must be allowed to expand and contract with temperature changes. These joints provide a "controlled crack" for this movement. All expansion joints are left in place, we cannot cover them up. We also re-cut all existing joints a little deeper to ensure that when it does move, it moves where we want it to, and not at a different weak spot in the concrete. How is Spray-Tek™ maintained properly? 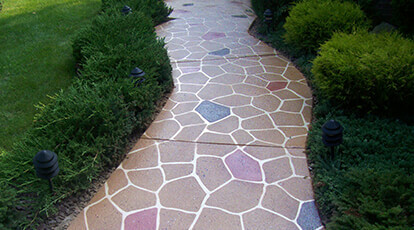 Although the Concrete Coatings Incorporated Spray-Tek™ Acrylic System is extremely durable, it is not indestructible. The rule of thumb is this: if it will scratch, chip or damage concrete, chances are it may damage the Concrete Coatings Incorporated Spray-Tek™ Acrylic System surface also. Exercise caution when setting heavy things on it. Take care not to drag heavy items that could scratch it. Periodic washing and sealing is all you should have to do to maintain the surface. Clean oil spills and the like as quickly as possible to keep it looking new. 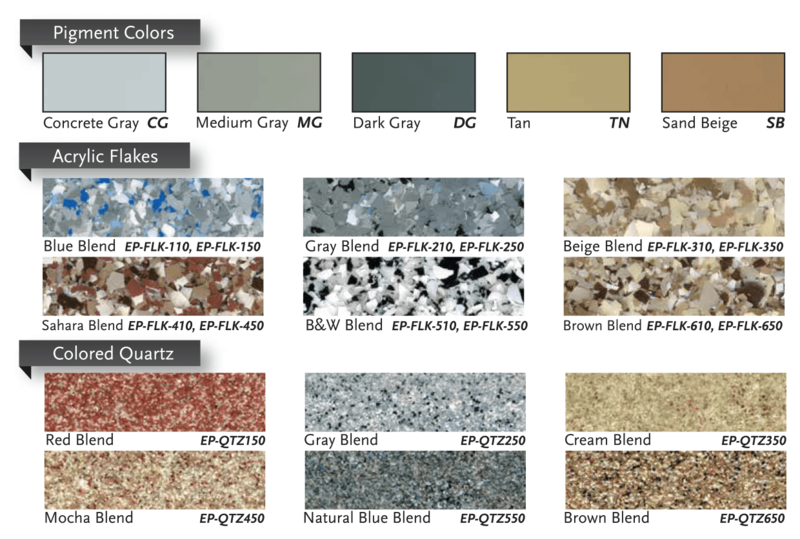 What are Spray-Tek™ color choices? Currently there are 28 standard colors to choose from in our Overlay Integral Colorants line. Our unique highlighting system provides unlimited color combinations. 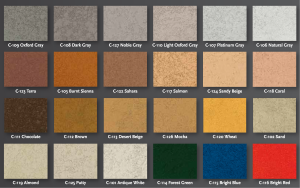 Custom colors are available at an additional cost. Will Spray-Tek™ wear or chip off? Concrete Coatings Incorporated Spray-Tek™ Acrylic System should not show any abnormal wear provided the acrylic sealer is replenished as wear occurs. We estimate this to occur no sooner than every two to three years under normal conditions. As long as the sealer is in place, this protective coating should absorb any wear. Any scuff marks, etc. generally disappear with a fresh application of sealer. How does it stand up against oils, stains, salts and discoloration? The protective properties of the sealer coat leave a non-porous finish. The majority of stains due to oil and grease wash off with mild detergent. Salt, deicers, etc. have no effect on it. In addition, because of its unique UV (ultraviolet) additive, it will not discolor due to exposure to sunlight, even in the harshest of conditions. It should be noted, however, that periodic cleaning will help maintain its beauty for many years to come. Cleaning can be performed with a mild detergent such as Concrete Coatings, Inc. EZ Clean. In fact, these protective properties must be maintained through biennial cleaning and sealing. Is Spray-Tek™ affected by cold weather? No. Because it is an acrylic, it remains flexible, yet extremely durable. Freeze/thaw cycles cause concrete to expand and contract. Because the Spray-Tek™ system is essentially part of the concrete surface, it moves with the concrete and not against it, as do other products like tile, slate, pavers, asphalt or concrete patches. Will my concrete still heave in the winter? We cannot eliminate the heaving of concrete. However, after application, the surface will be more much less porous. Large cracks that previously allowed greater amounts of water penetration can be reduced. Consequently, less water is retained and the effects of heaving caused by freeze cycles should be noticeably reduced over a period of time. How thick is Spray-Tek™ applied? Total thickness is approximately 1/8 - 3/32". We are more concerned about the acrylic penetrating the concrete than building up the surface. Actually, the thinner it is, the better flexural properties it has, which is very important to allow for expansion and contraction of concrete during freeze/thaw cycles. Skim coats can be applied thicker for holes and spalling (chipping, flaking). Larger and thicker areas are filled or rebuilt using high-density acrylic mortar called Fast-Patch™. How does Spray-Tek™ bond to concrete? First, the surface is etched with muriatic acid or EZ Prep and pressure washed to clean off dirt, remove loose aggregate, and open the concrete pores. Next, a very thin "skim" coat of the acrylic cement mix is applied by trowel. This is to provide maximum absorption into the pores of the concrete. Patterns are laid out using reinforced tape when the skim coat is dry. A second coat is applied using a drywall hopper in a random spray pattern, or troweled for multi-hued color variations. When this coat is dry, the tape is pulled, revealing the patterns, and two to three coats of solvent based sealer is applied using a roller. This sealer coat penetrates and softens the skim and spray coats and bonds all layers to the concrete. When dry, these two layers become a permanent part of the existing concrete, providing outstanding weather and stain resistant properties. How long has Spray-Tek™ been in use? Acrylic resurfacing has been in use since the early 1970’s. Polymer was added in the 1980’s to provide superior bonding properties, and increase strength, durability and longevity. What is the Concrete Coatings, Inc. SprayTek™ System? Concrete Coatings Incorporated Spray-Tek™ Acrylic System is a combination of a modified acrylic resin and specially formulated Portland cements. Colorants are added as needed. We combine the strength of cements with the durability and bonding power of acrylics. A penetrating sealer is applied to provide superb durability, weather, UV resistance, and to ensure a long product life. Are your coloring systems compatible with the overlay? Yes. 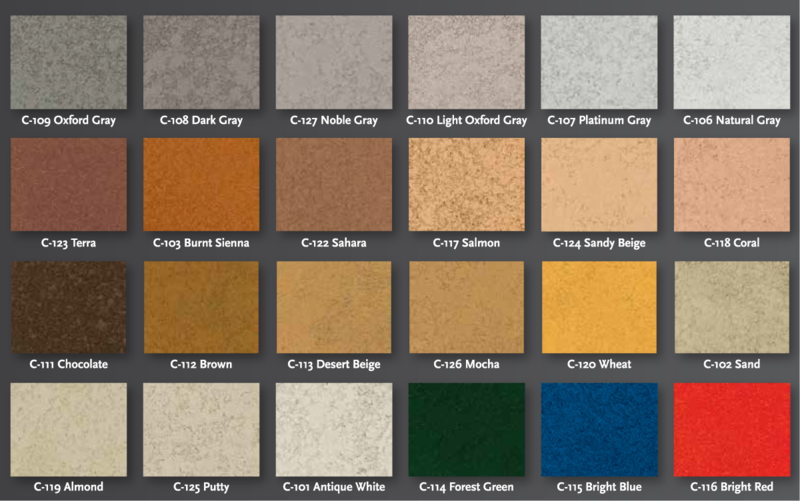 All 28 colors in our C Series integral color work well with our overlay. You may also stain or dye the material using our Vivid™ stain or Quickdye™. When can I stamp Stamp-Tek™ Stampable Overlay? Stamp the material when it is firm, not squishy. Unlike concrete, Stamp-Tek™ Stampable Overlay does not require heavy pressure or extreme tamping. Apply only enough even pressure to seat the mat and provide an impression. Allow 36 hours before foot traffic. How do I remove the lines from the gauge rake? Concrete Coatings, Inc. recommends the use of a funny or magic trowel. How do I spread out and even Stamp-Tek™ Stampable Overlay? We recommend the use of a gauge rake purchased from your local supply store. What is Duraset™ VAE for? The VAE primer is a specialty formulated vinyl acetate emulsion designed to be rolled or sprayed prior to application of the stampable overlay. Once the overlay is placed over the primed surface it re-emulsifies and properly bonds and strengthens the overlay to the concrete. Troubleshooting VIVID™ Acid Stain: Stain won’t take. Reason: If the stain is not fizzing it may signify an unsuccessful chemical reaction. Stain reacts with lime and other latents within concrete substrate. When a reaction does not occur it could signify that the concrete may be too old, washed out and/or chemical residue or oils may be interfering and preventing a proper reaction. If the stain is pooling on top of the substrate, a sealer or other curing agent may still be on the concrete preventing penetration. Solution: Make sure any chemicals on the concrete are removed. If the concrete is old or washed out or you are dealing with a very tight power trowel, it may help to add no more than one cup of muriatic acid to one gallon of Chemical Stain Note: do not add muriatic acid to turquoise; doing so will cause an unfavorable result. What coverage should I expect from Micro-Tek™ Micro-Toppings? The first application can be applied with a squeegee or trowel at about 200 sq. ft. per bag of RG and SG micro toppings. Coverage with additional coats of smooth grade, usually applied with a trowel, increases due to a smoother surface with less voids etc. The second and subsequent coats are usually applied at 300-600 sq. ft.
How much water do I add per bag of Micro-Tek™ Micro-Toppings? 1 ½ - 2 gallons of water for rough grade micro topping and 2 ½ gallons of water must be added to each bag of smooth micro topping. Once the water is added it is important to allow time for the polymers to become saturated. Wait 5-10 minutes; then remix and apply. Is it necessary to apply rough grade prior to applying smooth grade micro topping? Yes. You must put a base coat down prior to applying a smooth grade finish. Smooth micro-toppings are not designed for repair, spalling and uneven surfaces. We recommend the use of a single coat of RG micro-topping or the use of our G-100 and Duraset™ polymer to prior to applying the smooth grade topping. May I use QuickDye™ when polishing concrete? Concrete Coatings, Inc. recommends applying dye upon completion of your 400-grit pass. A second application of dye may be applied after the 800-grit pass to maintain and intensify color. Does QuickDye™ require cleaning prior to the sealer application? Cleaning is essential to ensure proper adhesion of sealers. We recommend the use of an auto-scrubber or white pad on a buffer to remove excess dye residue. What is the benefit of the penetrating agent when using QuickDye™? The penetrating agent allows for better penetration and adhesion of the dye, increasing color performance and mottling. When should I use the penetrating agent with QuickDye™? The penetrating agent should be added in most instances, especially very tight, power-troweled or polished surfaces. What coverage should I expect while using QuickDye? QuickDye™ will yield 200-400 sq. ft. per gallon, depending on various factors including concrete porosity and finish. How long after the final coat until I can walk on Shield™ Epoxy? You may walk on your new epoxy floor 24 hours after the final application. You may begin moving in equipment or utilizing vehicular traffic no sooner than 72 hours. It takes seven days for epoxy to fully cure. How long after applying the Shield™ Epoxy should I broadcast quartz or flake? All broadcasting should be done within 45 minutes. How long until I can get back on Shield™ Epoxy to do additional coats? All epoxies have a finite window of opportunity to apply additional coats. Any additional material must be applied within 12-24 hours of the last application. Spike shoes are recommended. If this is not possible, the floor must be sanded and deglossed prior to any application of new material. Is your Shield™ Epoxy self leveling? No. However, when applied properly you will achieve a nice even application. What is the preferred method of application for Shield™ Epoxy? We recommend all epoxies are applied with a squeegee in one direction and then back-rolled 90° to eliminate lines and to ensure an even coat. Are custom color options available for Shield™ Epoxy? Custom colors may be ordered. There is a 50 gallon minimum and a two week lead time required for processing. How many colors are available for Shield™ Epoxy? 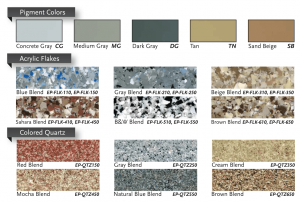 Concrete Coatings, Inc., offers five standard pigment colors, six flake blends and six quartz sand blends. What is the coverage of Shield™ Epoxy? The average coverage is 100-200 sq. ft. depending on substrate or desired texture. For example: coverage will be less over flake and quartz than it will be when going over pigmented epoxy. Is Shield™ Epoxy UV stable? No epoxies are UV stable and must be used indoors. However, our UV Shield epoxy is extremely UV resistant and is a wonderful top coat for an epoxy floor, acid stain or interior countertop. UV shield may also be pigmented using one of our five standard pigment colors. What is the proper mix ratio for Shield™ Epoxy? How many people do you recommend be on a Shield™ Epoxy job? Concrete Coatings, Inc., recommends 2-3 people for the first thousand square feet and one additional person for each additional thousand square feet. What surface preparation is recommended for Shield™ Epoxy? Shot-blasting or grinding is the preferred method of surface preparation for a concrete slab. Your substrate must have a profile to allow for proper adhesion and be free of any sealer, dirt, grime, oil, or residual adhesive. Can FastPatch™ be used to fill cracks? No. We recommend the use of a joint repair epoxy when repairing cracks. Please refer to the CCI catalog for the appropriate product. When can I grind and finish shaping Fast-Patch™? In approximately 30-60 minutes depending on temperature and other weather conditions. How long before I can coat over FastPatch™? Do I need to mix Fast-Patch™ with polymer? No. The polymer is in the mix and activated when you stir in water. What coverage should I expect from a bag of Fast-Patch™? Is SuperSeal™ 20WB UV Stable? SuperSeal™ 20WB is UV stable and a perfect choice for interior and exterior application. Can I use Superseal™ 20WB on surfaces other than concrete? SuperSeal™ 20WB may be applied to many porous surfaces including, stone, brick, manufactured stone, overlays and many types of tile. We recommend you apply sealer to a small section of the substrate to ensure proper adhesion. What is the preferred method of application for SuperSeal™ 20WB? Use a low pressure sprayer, short nap roller or lamb’s wool applicator to apply Superseal™ 20WB to the substrate. It is crucial not to over apply the material or to allow pooling, as this may lead to undesirable results such as whiting.